What could possibly be better than a new dress? Why, TWO new dresses, of course! To make the Sweet Dress reversible is quite easy. One of your fabrics will show on both sides and the other will only show on one side. Cut the fabric that will show on both sides as directed on the pattern. With the other fabric, cut the neckline down 3/4 inch for the main dress pieces. 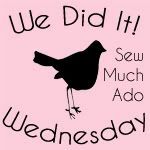 For the sleeves, cut 3/4 inch down from the top of the sleeve and from the hemline of the sleeve. Iron as directed for the first fabric. There is no need to iron the second fabric. 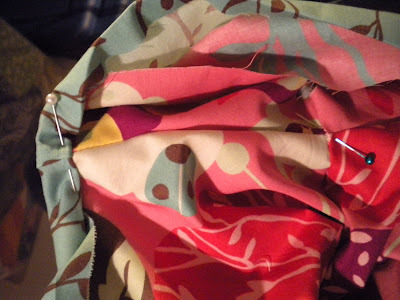 Sew each dress together as directed in the pattern until just before your create the casings (do not hem). Place the dresses together with the wrong sides facing and the ironed dress on the outside. Pin the dresses together at the underarm seam and both sleeve seams on each side, matching the seams. Fold the casings over as directed, with the second fabric tucked into the casing. 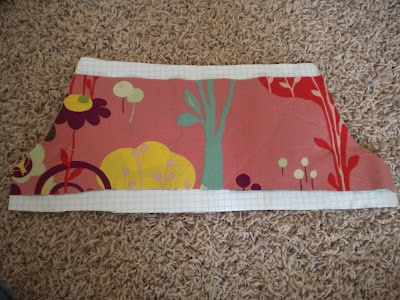 As you stitch each casing, it should catch your second fabric as well. Finish the casings as directed. Once you have the casings finished, press the dresses to make sure your hemlines are exactly even. If they don't match exactly, trim them to match. Iron both hemlines under 1/4 inch. If you want lace, attach it to one of sides on the 1/4 inch turn-under. Then stitch the two layers together, with the lace in between. I want to put you on a committee to cure a disease or figure out how to beat global warming because you are so smart you could figure out a way to do it! wow, I love those fabrics!!! CUTE!!!! The dress and the fabrics. I love this, such a cute dress and idea! amazing .....again! :) I want your talent! I love both sides of this sweet dress! That is the best idea! Not only does the lucky girl get two new dresses but I get less laundry to do. It win win. Gorgeous dress. this one is by far my favourite... i am gonna try it! This is way cute! I just found your blog and think it is wonderful! You are so talented! I love looking at your blog to see what you will come up with next! I can't believe you are able to make all these different varieties of dresses from one pattern. I love it. This reversible one is my favorite. Definitely a plus that it can be flipped over to the clean side when out and about! Beautiful, I've been eyeing that pattern for sometime now. It's good to see someone else's take on it. Super cool! Definately going to try this! What a great idea! Beautiful dress! That is so cute! I love the fabrics! Awesome fabric choices and colors! That's one lucky little girl! This is so fun, I would love to win a pattern! My daughter would love this dress!